Tammi over at Momma's Meals has this really cool feature on her blog where she makes another blogger's recipe and then features them on a specified Friday--a fun thing she refers to as "Food on Friday." Today she's featuring one of my recipes, so I decided to feature one of hers in return! Make sure you go check out her blog to see which recipe she's showcasing today! 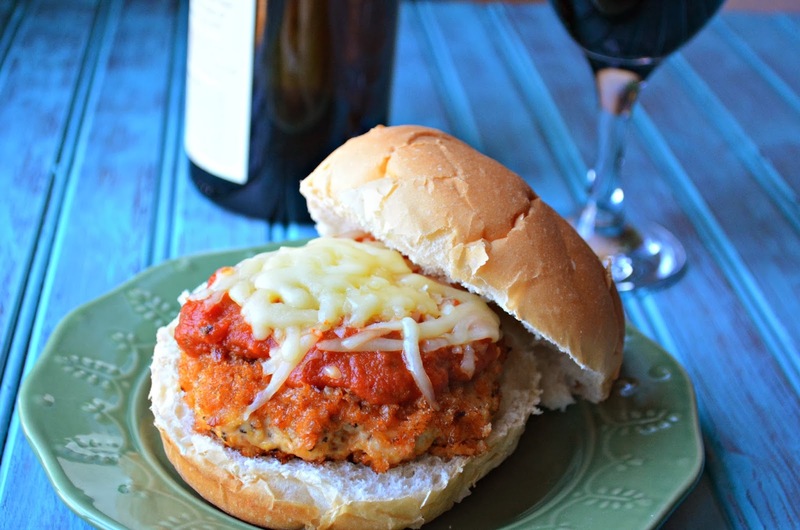 I quickly chose to make these Chicken Parmesan Burgers since the idea intrigued me. 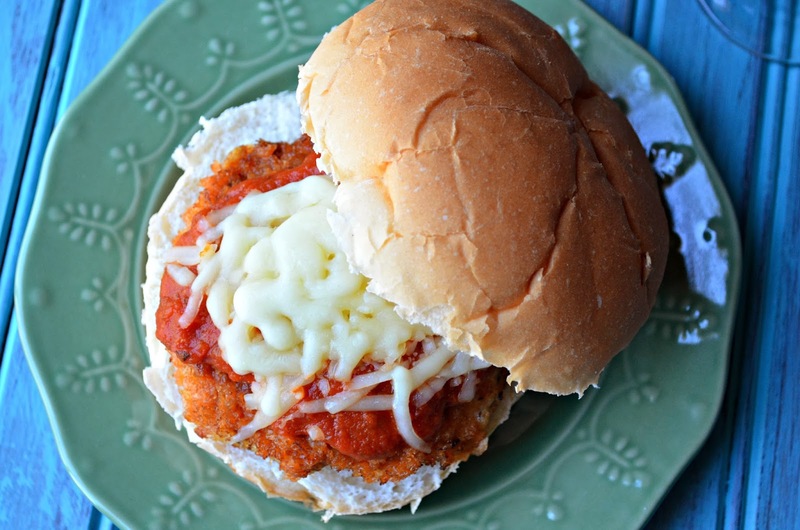 I usually make Chicken Parmesan the old-fashioned way and then scoop a cutlet onto a roll, so this simple version that uses ground chicken and the classic ingredients to make it into burger form is genius to me! All the same flavors are there, but they're packed into a patty and grilled. Simply amazing! I know you guys will love this one. It's delicious. Enjoy! Mix chicken, 1 tbsp. oil, sauce, basil, onion, garlic powder, salt, pepper, red pepper flakes and 1/2 cup Parmesan cheese together. Form the chicken mixture into four balls. Mix remaining 2 tbsp. Parmesan cheese with the panko crumbs. Flatten burgers into patties and coat each one with the panko mixture. Put burgers on waxed paper and allow them to set in the refrigerator for about 30 minutes. Pour remaining 2 tbsp. in a large frying pan over medium-high heat. Cook burgers until done and crispy, about 4 minutes per side. Drain them on a paper towel. Top burgers with some additional tomato sauce and shredded mozzarella cheese. Put in oven for five minutes, until cheese melts. Oh I'm so glad you chose this one to try Amy, it's one of my favorite summer dishes! 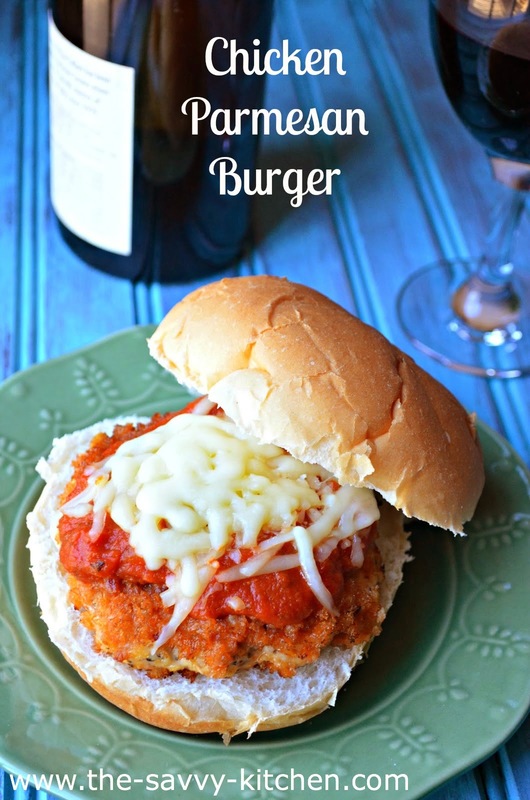 I love chicken parm and I was blown away at how much a bite of this burger tasted like a bite of chicken parm! Thanks for allowing me to feature you and your blog today!! It's been so much fun!